Many well-known, accomplished and successful artists have benefited throughout history from having an artist mentor in their lives. For example, American painter, printmaker and sculptor Jasper Johns is known for being a mentor to Pop Art painter, James Rosenquist. Johns played a crucial role in the Neo-Dada movement and is known to have bridged the aesthetic gap between Abstract Expressionism and Pop Art during the 1950’s. Rosenquist benefited from Johns turn to the outside world, which presented everyday objects and mass-produced goods as the subject matter of fine art. In his 2009 memoir, Painting Below Zero: Notes on a Life in Art, Rosenquist details how working with Johns allowed him to contemplate his practice from a different angle, which greatly influenced his career and emergence as one of the nation’s foremost contemporary artists. As Rosenquist notes, it’s important to consider and identify potential mentors in an effort to develop your art practice. Do you ever sit back and reflect upon the people in your life that you admire or who have made a lasting impression? Think about someone who has guided you, motivated you, taught you, or inspired you. Perhaps multiple people from different stages of your life come to mind, or maybe it is one special person who has made an impact. There are surely people all around you who are knowledgeable, insightful, and successful. Many of these people are mentors, and you have most likely had multiple growing up, whose wisdom and experiences you have tapped into and utilized without even realizing it. Ralph Waldo Emerson said, “Nothing great was ever accomplished alone,” and from Emerson’s words we can deduct that mentors are invaluable, and can even be considered essential for artists who want to grow personally and professionally. For most art school students, graduating is a scary time. Entering into the “real world” can seem overwhelming and cause stress. 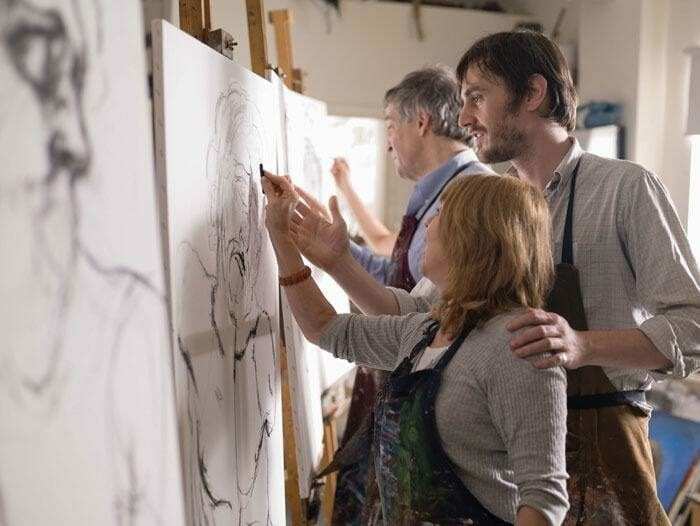 An artist mentor can provide an art school student with advice, counsel, expertise, encouragement, and motivation that they need to achieve their goals. While it is easy to get sidetracked, an artist mentor will hold you accountable, build your confidence, be a resource, and help pave the way to help you succeed. A mentor provides you the opportunity to utilize their skillset and learn from their mistakes. “I think the best thing about having a mentor is knowing that they have been down the same road that you are going down. Learn from their story,” says Shaunda Lambert, a Creative Career Coach and a Candidate Engagement Specialist for creative recruitment firm Creative Circle. A mentor can help you define your vision. Since the art world can be a tough industry to break into, having an artist mentor share their career path can be extremely beneficial. However, its important to note that an artist mentor is there to guide you, but not hold your hand through everything. A good artist mentor will show you the ropes, empower and equip you with the elements critical for success, and then allow you to grow on your own. Lambert recalls that one of her mentors realized that being introverted and shy was not going to help her excel in her career. “She decided to step outside of her comfort zone and engage in more social events, and now she is an Executive Director and influencer in her career,” says Lambert. That experience taught Lambert the importance of being confident and assertive, no matter your natural inclinations. As a result, Lambert always makes time to schedule calls or meetings once a month with her mentors to make sure she stays on their radar. She notes that it’s the mentee’s responsibility to maintain the relationship with their mentor, as they are the ones benefiting most from the relationship. When seeking an artist mentor, it’s important to target someone in the industry because finding people who are excelling with their art business or art career demonstrates that there is a proven approach that you can incorporate into your own life. It is also important to make sure the artist mentor you choose has the time to manage a mentor relationship. In addition, you’ll want to make sure that you’re working with an artist mentor whose personality, vision, and skill set aligns well with your own. Working with other like-minded artists can be beneficial to your career. Of course, finding an artist mentor can be a little more complex, since many working artists and creatives work on their own at their own studios or creative shops. Lambert says there are quite a few avenues creatives can take when trying to find an artist mentor, including utilizing the power of social media and connecting with someone on LinkedIn, asking your boss to coffee, or joining an association that provides networking opportunities. Organizations like AIGA, New York Foundation for the Arts, and New Urban Arts offer plenty of opportunities to meet a potential artist mentor that can help your practice. You can also leverage your existing connections any way you can. For example, you can use Facebook as a way to reach out to friends and see if anyone knows a working artist that may be interested in mentoring you. Ultimately, you can never be too proactive in your quest to find an artist mentor. As Lambert mentioned, it’s the mentee’s responsibility to maintain the relationship. That could be as simple as a phone call or meet-up once a month. Nine times out of ten, your artist mentor is going to be juggling a busy schedule, so be sure to appreciate their time and reach out with a specific question or idea in mind. Take initiative with your artist mentor by being clear about the specific goals or intentions you have for your art career. Show them your work, ask them for their critique, or determine whether its possible they might put you in touch with other art world players, like gallery owners or potential collectors. It’s never a bad idea to get out there with them, either: attend museum and gallery exhibitions, or auction house openings, and get a sense of what they think about the work they’re seeing or where they think the market is headed. Finally, remember that mentorship is something that can benefit you throughout your entire your lifetime – you are never too old or too experienced to receive guidance from someone above you. So get started, find an artist mentor, and allow yourself grow from them. Kate is an intern at Orangenius. The best mentors are more than subject matter experts. It’s a lot easier to find answers to specific questions with the help of Google than to find and engage the right expert. Mentors are motivated by their desire to be helpful whenever and for as long as their proteges need them. We are rewarded by contributing to our proteges’ evolution. A real mentor is N E V E R in it for personal economic gain. So its harder to find a real mentor than to find a subject matter expert. I’ve been a mentor to business entrepreneurs for more than 10 years, and I’ve come to the conclusion that all entrepreneurs are driven by creative genes which they have in common with artists. And they face the same challenges.